How much should you exercise to burn your favorite food? We have just a few more days until the end of 2016, so that is why people around the world are preparing to leave behind their bad habits and begin new year with a better version of themselves. But the reality is that only about 8% of all people who make New Year’s plans actually manage to achieve their goals. One of the most common wishes for the new year’s weight loss. Well, if this goal is also on your list of New Year’s changes, it’s time to find out how much is really needed to practice in order to burn your favorite foods and improve your figure without having to start dieting. Well, why would not you start right away? 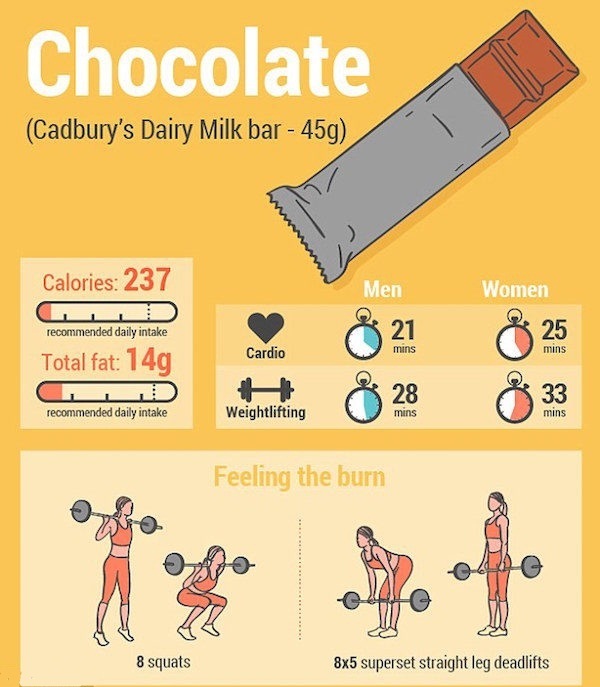 One chocolate of 45 grams contains 237 calories and 14 grams of fat. The men would need about 21 minutes of cardio or 28 minutes exercise with weights in order to burn what has been eaten, while the women would have had 25 minutes of cardio and 33 minutes exercises with weights to achieve the same effect. 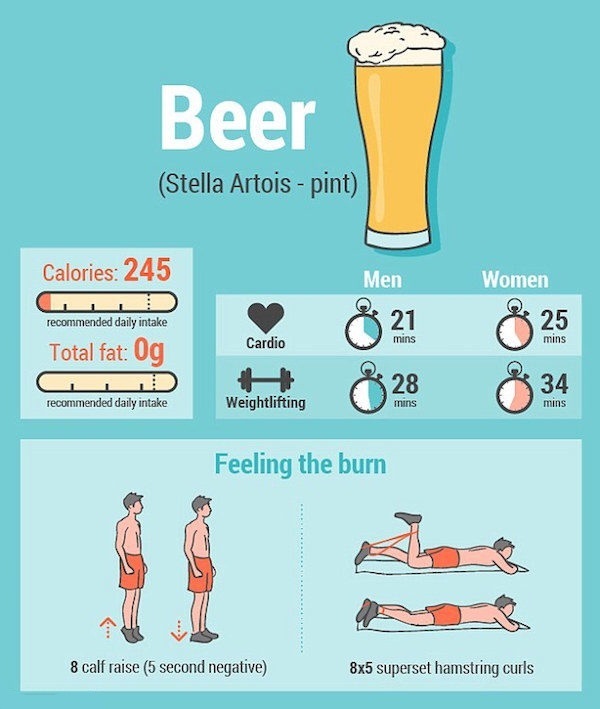 A glass of beer contains 245 calories. To burn immediately, the men will need 21 minutes of cardio, while women 25 minutes. On the other hand, it takes 28 minutes exercises with weights for men and 34 minutes for women. 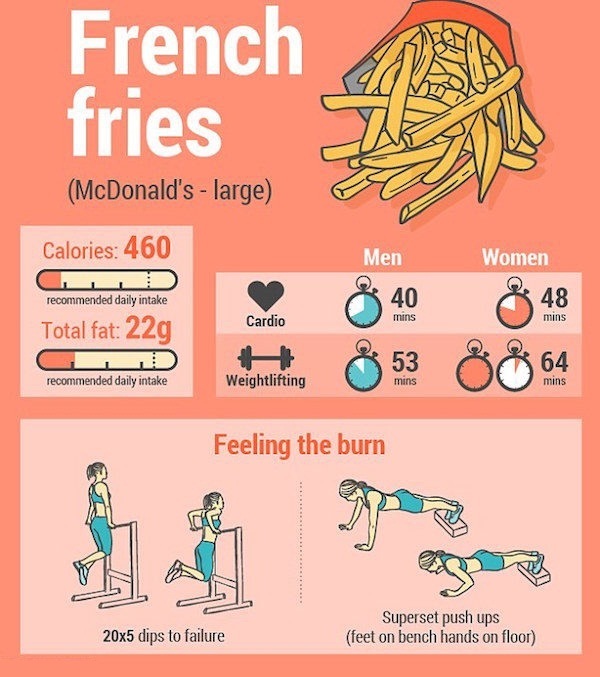 A big portion of of fries contains 460 calories and 22 grams of fat. Women should exercise 48 minutes of cardio exercise or 64 minutes of exercise with weights in order to burn, while the men would need 40 or 53 minutes for the same effect. 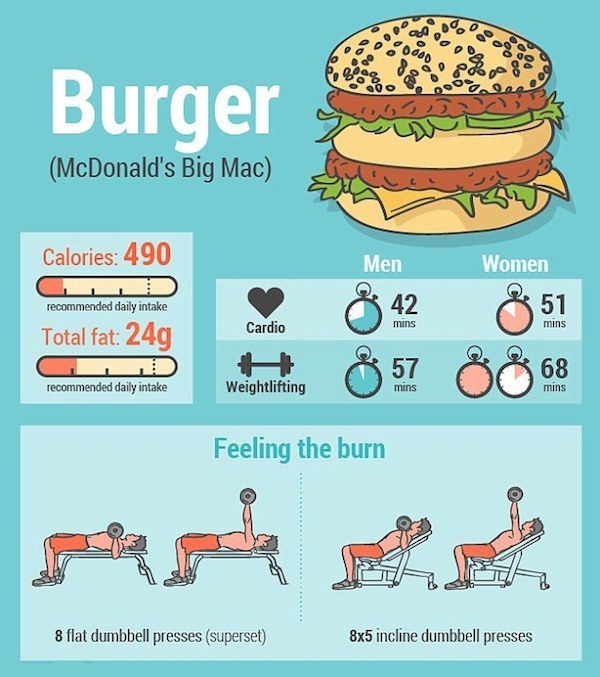 One burger contains about 490 calories and 24 grams of fat. To burn those calories, men should exercise 42 minutes of cardio exercise, or 57 minutes with weights. On the other hand, women will need 51 minutes or 68 minutes of cardio exercises with weights. 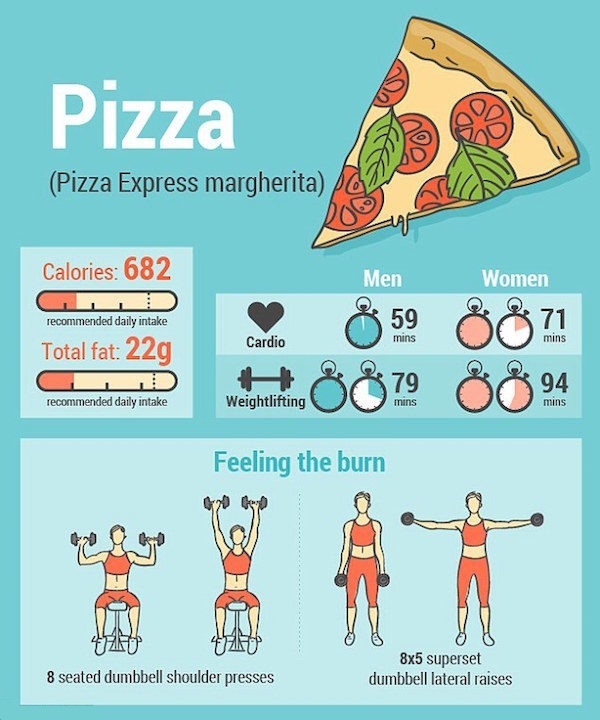 Pizza contains 682 calories and 22 grams of fat. 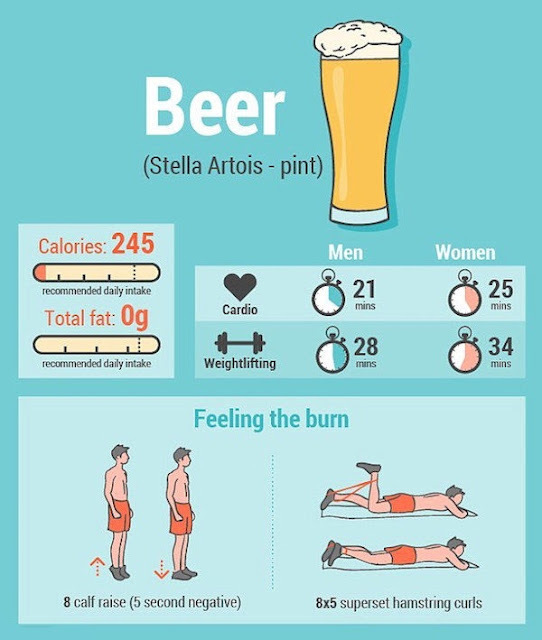 To burn these calories men should exercise 59 minutes of cardio exercise or 79 minutes in the gym, while women 71 minutes or 94 minutes of cardio with weights. At the end of this list is the cake. 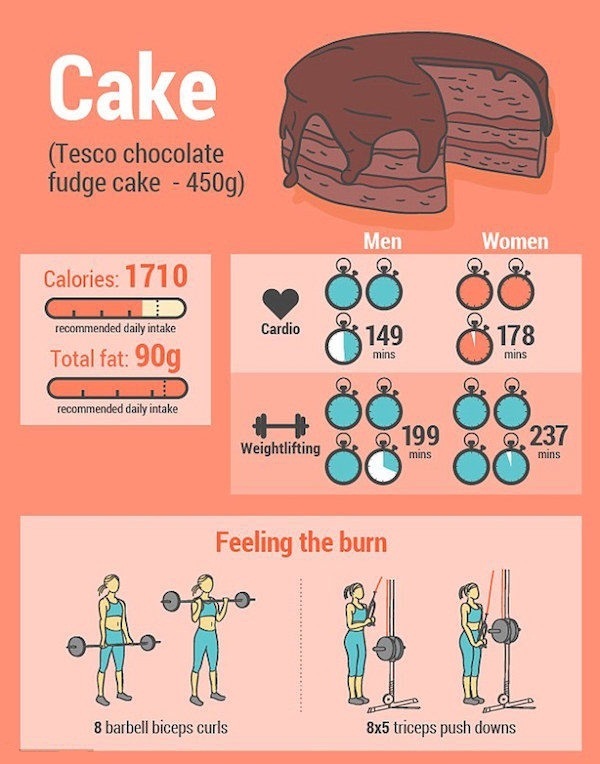 It has 1,710 calories and 90 grams of fat. Men should exercise 149 minutes of cardio or 199 minutes with weights in order to burn those calories. For women are needed 178 minutes of cardio or 237 minutes in the gym for the same effect. Did you know a standard glass of wine contains as many calories as a small chocolate and a pint of lager has as many calories as a packet of crisps? 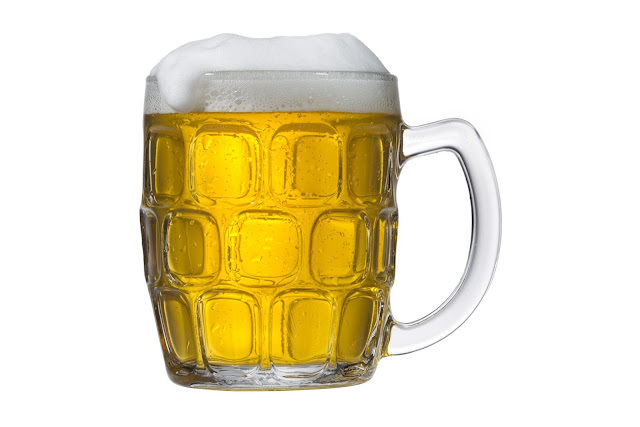 guide, a pint of lager and a 250ml glass of wine both contain 3 units of alcohol. • Alternate an alcoholic drink with a diet soft drink or water – this will help to prevent you becoming dehydrated. • Choose drinks with a lower ABV (alcohol by volume) instead of your usual tipple. 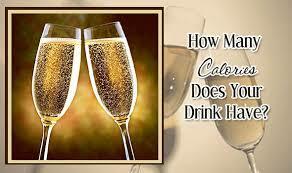 There’s an increasing range of lower alcohol choices available and most also have fewer calories. • Don’t drink on an empty stomach, as this can lead to snacking. If you do snack while drinking, avoid high-calorie snacks such as crisps, pork scratchings chips. Try lighter options such as pretzels, plain popcorn or oven-baked crisps. • Drinking in rounds can mean you end up drinking more than you intended. Opt out and drink at your own pace. • Try cutting down with a friend, as you’ll be more likely to stick to it with moral support. • Eat a healthier dinner before you start drinking. 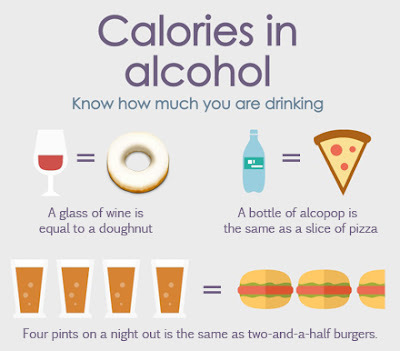 Order or cook before you start drinking so you’re not tempted to go for the less healthy options. 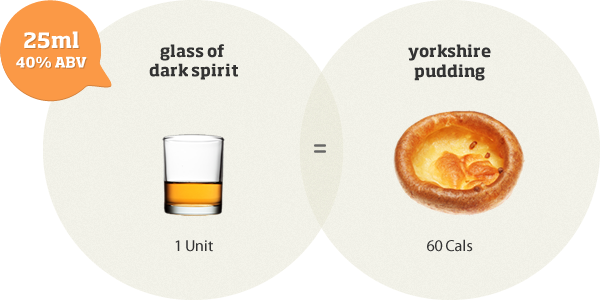 may be significantly worse for your health than frequently drinking small quantities. the same as three teacakes, the calories from alcohol soon add up.